Since 1928, the 3-star superior Hotel Mon Repos has symbolized Geneva’s hospitality. Ideally located within walking distance of the UN Headquarters in the heart of Geneva’s International Organisations. A stone’s throw from Lac Léman and the City centre, the hotel is nestled between beautiful parks and is within walking distance of the Science Museum and Geneva’s famous pier, Bains des Paquis. Mon Repos has been managed by the same family for several generations. 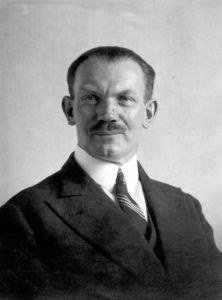 The founder, Mr Charles Sorgius, a brave entrepreneur, bought the hotel in 1928 with his wife, Lina Riesen. The early days were challenging and precarious means of transport did not work in the hotel’s favour. The business district expanded around the central station and in 1920, the International Labour Office moved into the area. Business was slow but with his typical determination and drive, our Great-grandfather went looking for clients at the station armed with sign advertising ‘comfortable rooms for rent’. When the Second World War broke out, the economy was slow and only a few soldiers were using the hotel. In order to keep the business alive Mr Sorgius was managing all aspects of the day to day running of the hotel with the support of his wife. With the end of the War, the situation improved, the United Nations Headquarters expanded and more International Organisations moved into the surrounding area. 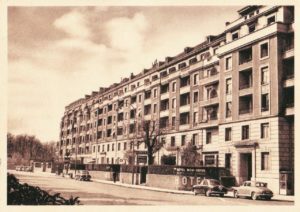 With drive and perseverance, our Great-grandfather turned the situation around and eventually bought the neighbouring buildings to extend the residence and increase profits. The following generations inherited the same passion for Swiss hotel management. His descendants, Max and Lydia Keller-Sorgius followed by Eric and Claire Keller. Their dedication and commitment has allowed our family business to stand the test of time. As the 4th generation, my sister and I are extremely grateful to our ancestors and are proud of our heritage. We strive to keep up the tradition of Swiss hospitality, providing a warm and authentic welcome. We wish you an excellent stay at Hotel Mon Repos. The Management team, Olivier and Vanessa Keller. We understand the importance of respecting the Environment and for several years have been using environmentally friendly cleaning products. 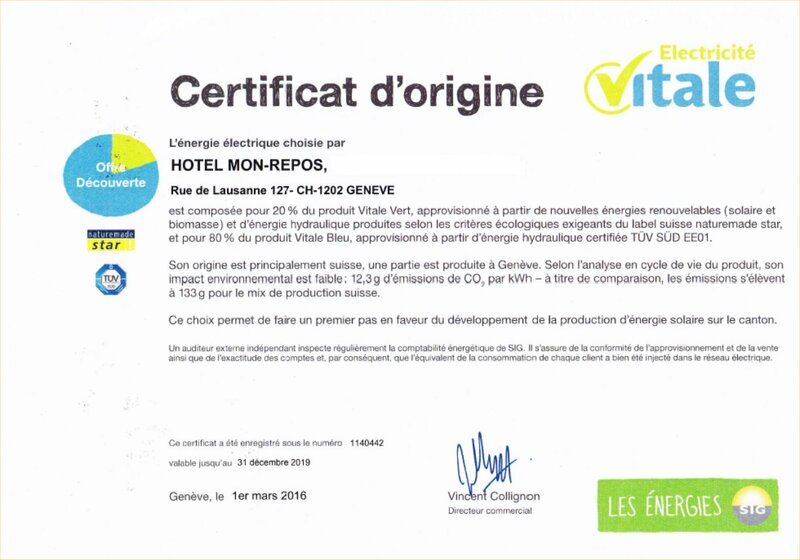 We use electricity from renewal sources (bio mass and solar power) and hydraulic energy from local sources, mainly Swiss. This is a step in the right direction towards the expansion in the use of solar energy in the canton of Geneva.